HMD headset to be the future of gaming? Not content with attempting to usher in the advent of 3D console gaming, it seems Sony now has its sights set on the next quantum leap – virtual reality. Speaking in a video interview to promote next month's b.tween 3D event in London, SCE Studios exec Mike Hocking explained that Sony's recently announced HMD device could represent the future of 3D gaming by allowing users access to a full 'virtual' world. "Another thing that's coming back which I'm very excited is the notion of virtual reality," he explained. "So we have our new HMD – or head-mounted display - which was announced at CES earlier this year, and you can see that we can now get back to where we really wanted to get with virtual reality in the '80s. "We've now got the power to do it, we've got the screen resolution to do it, we've got the processing power to update fast enough so we can have very immersive experiences on head-mounted displays in gaming in the not too distant future. "Being in a virtual world where I can see my virtual hands or a virtual gun with all the things we can do in the gaming world is going to be absolutely amazing," he added. 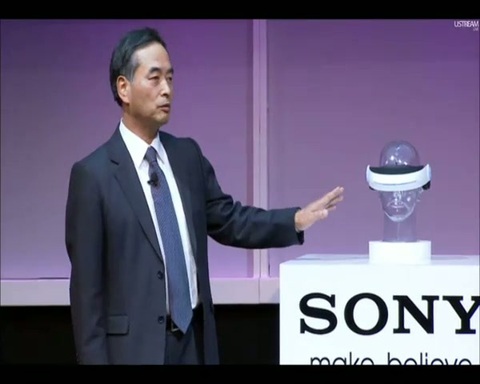 There's no release date set yet for Sony's HMD or even a firm set of tech specs. Have a look at the clip below from Sony's CES show to see what the gizmo looks like. Staring even deeper into his crystal ball, Hocking also explained that he'd love to see AR-enabled contact lenses that would super-impose information about anything in your line of sight, Terminator-style. "Most of the really exciting stuff is out there in the R&D area at the moment – like having contact lenses with cameras and sensors built-in so that everything you see can be augmented with useful data," he said.